Photos of the ATM robbery near Moira portray just how substantial the damage was to this popular filling station. The Spar store on the Glenavy Road was robbed in the early hours of this morning when a number of men used a digger to remove the ATM. 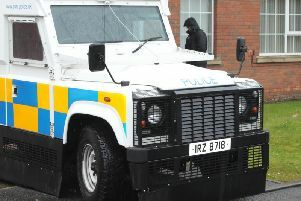 It was the latest in a spate of ATM thefts and a top businessman has called for an urgent meeting with the PSNI. Glyn Roberts, Chief Executive of the Retail NI branded the latest ATM theft from a Spar store on the Glenavy Road near Moira as ‘disgraceful’. Police are also investigating a possible link between this incident and an ATM theft from the Ballymena Road, Antrim on Friday 1st February. Mr Roberts said: “This is a disgraceful attack on one of our members. It is has caused extensive damage to a local retailer that provides an invaluable service to the local community.